Having opened on Labor Day, the Birdsboro Chiropractic and Wellness Center is the joint practice of Dr. Laura Edwards, D.C. & Licensed Massage Therapist Dona Sellman. They are happy to offer their clientele unique treatment plans, rather than the ‘cookie cutter' approach which many patients encounter elsewhere. The center offers a combination of heath and healing services for all members of the community – chiefly chiropractic treatments, massage therapy, weight loss, toxicity testing and nutritional analysis. Coming to the center in 2011 is an ionic footbath treatment, which involves a special soaking of the feet designed to draw toxins from the body. Dr. Edwards, who previously worked in Reading as an associate doctor with Dr. Martin Matthews, is focusing her practice on a relatively new technique licensed through the Neurological Relief Centers organization (www.nrc.md). According to Edwards, this treatment can help those suffering from such health and chronic pain issues as Multiple Sclerosis, Parkinson's disease, migraine headaches, Fibromyalgia, post-stroke problems and more. "The nervous system has a coating around it and if you pinch, torque or otherwise put pressure on that coating you start having dysfunction and disease – along with that comes pain, numbness, tingling, weakness, paralysis - all the major steps of some of these diseases - and there is nothing out there to make them better or help them stop that progress," said Edwards. She describes this new service as a specialized "light pressure technique" that will often let the recipient know within a couple of minutes whether or not it is going to help them. With this technique being practiced publicly for only approximately 18 months, Edwards is one of about 200 doctors in the nation licensed in its practice. "Multiple Sclerosis and Parkinson's and other diseases just get worse and worse, nothing makes them better – the only thing in our society right now is to try to stop or slow down that progress, but we have not succeeded. This technique is like watching miracles – it's just amazing," Edwards said, "when someone is bound up from a stroke on one side of the body and they lay on the table with that light pressure on their neck and their arm relaxes down to their body – and it has not done that since their stroke six years ago – that is amazing to watch." She says that while most insurance companies do not pay for this technique, she offers flexible cash payment options and free three day health assessment period where she works with her patients to see if the technique will help them. "I do not want to waste someone's time and money if I cannot help them, and at the end of that time period I sit down with them and tell them what I recommend. If I don't see results I do not see them as a patient," she said, "my goal is to get someone to 90 to 100 percent improvement, and once I get someone to maintain that for a short period of time their body is healed. It is not like traditional chiropractic where I see people who need to keep coming back." She describes it not as her healing others, but helping people "heal themselves by resetting (the body)". "For some people, I am the fortieth doctor they have seen, or the thirty-seventh doctor they have seen. You lose a lot of hope when you are in constant pain and nobody has been able to help you. Nobody comes knocking on my door the first day they are diagnosed with these things – it's a couple of years down the road – and they have tried everything- this is a reasonably new technique and I am trying to get it out to people as an option – what would it hurt to come in and (try the technique)." She said that most people will either get seventy percent better, one hundred percent better or notice nothing within just a couple of minutes. This test lets her know whether they will respond well to the treatment "from day one". "It's about what can we work out. People get a lot of relief after seeing me 3 or 4 times, and I am not going to say ‘here is this amazing treatment, I'm sorry you cannot afford it,'" said Edwards, "that is why I have flexible payments – what can you put down and what can you pay – weekly or monthly, whichever works within your budget, and let's get you functioning again. Let's get you happier, let's get you back to work." 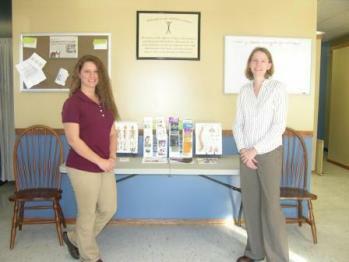 In addition to traditional chiropractic and Neurological Relief Center treatment, Edwards also serves as a volunteer for the Foundation of Wellness Professionals – which means going out into the community and giving lectures, screenings and classes on wellness for organizations like clubs, churches, community centers, as well as assisting with corporate wellness. Sellman, a member of the Associated Bodywork and Massage Professionals, offers specialized health services that include general relaxation massage, deep tissue massage, sports massage, chair/table massage (visits to your workplace, baby showers, etc), therapeutic massage, myofascial release, plus more. Since massage supports chiropractic, and vice-versa, the variety of services that Selman and Edwards combine to provide can be very helpful to people of all ages and from all walks of life. "When you have chiropractors and massage therapists working together to (treat an injury), people can recover with amazing quickness," Sellman said.